A completely upgraded and deceptively spacious three double bedroom end of terrace family home, situated in a quiet cul-de-sac location in the popular residential area of Bewbush. 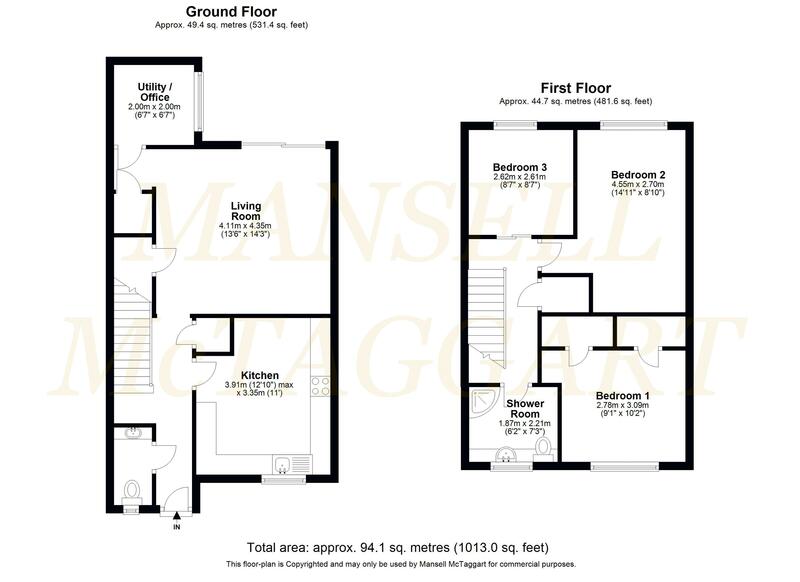 Upon entering the property through a developed porchway into the main hallway there is space for shoes and coats and a recently replaced and remodelled cloakroom to your immediate left which allows for ample space and has a low level WC and wash hand basin with mirror over and cupboards. The kitchen to your right has been remodelled and refitted with a range of wall and base units incorporating cupboards and drawers with work surfaces over, gas hob and oven with stainless steel extractor hood over, space for a dishwasher and space for large freestanding fridge/freezer with further downlighting and tiled flooring finishes the room beautifully. A wall in the kitchen has been slightly moved to provide space for a three/four seating dining table also. To the rear of the property you have a very spacious living room which has space for two large double sofas with a large window and patio doors overlooking the rear garden and ample space for any other freestanding furniture. The hallway comes with three very large storage cupboards and a further door takes you to the recently refurbished utility room which has space for any storage things you may need. Heading upstairs you have three bedrooms, all of which can comfortably house a double bed. The third over looks for rear garden and has space for a double bed and any freestanding storage you may wish to have (currently being used as an office space). The master bedroom is a comfortable king size room with two large fitted wardrobes and overlooks the front garden respectively. Finally, the second bedroom can also hold a large king size bed and is ample space for any freestanding storage you may wish to have. Finally, the shower room has been replaced in a white suite in cream tiling and encompasses a large double power shower, low level WC, wash hand basin and vanity mirror dead ahead, full length heated towel rail and is finished cream tiling with a large frosted window allowing in plenty of natural light. The loft space is partially boarded and insulated and completes the house. Externally, the rear garden has been landscaped and remodelled to be laid mainly patio areas with a section of decking to the front with trellising and lean-to over top, all enclosed in by brick wall with gate to rear and access to ample communal parking areas. To the front, the property has a pretty enclosed front garden enclosing wooden picket fencing and further access out to a walkway and further communal parking for yourself and guests. The property is offered with no onward chain and viewings are highly advised. Bewbush Community Primary School, Waterfield Primary School, Holy Trinity School, St Wilfrid’s School.